Real estate broker Terry Sortwell uses his Holland 38 for both work and play. Classic Boat Shop on Mount Desert Island has found a niche with the construction of Pisces 21 daysailers. It’s a yearly ritual each fall: the harbor empties as Castine hunkers down for winter. The next generation brings a new touch to family-run Maine boatyards. 30 years of chronicling the coast. A handful of Maine artists have left legacies to promote future artists. She wanted to join the club of people who build things with their hands so she signed up for a boatbuilding class. Fall arrives and nature adjusts. A glimpse at just a few of the people, boats, and innovations along the Maine coast from the last 30 years. Slide Show: View more images by Wayne Hamilton, this issue’s The Maine I Love photographer. Video: Do you need more convincing about the ocean’s healing power? Watch a short clip from Between Two Harbors—We Are Ocean, a documentary that reveals the restorative and healing powers of nature. Video: Take a tour of the University of Maine’s Center for Aquaculture Research. On the cover: Photographer Peter Ralston calls the cover photo of the Milky Way rising above a fleet of Maine windjammers "River of Heaven." He took the photo in Brooklin, where windjammers had gathered for an event. "They dropped anchor off the WoodenBoat School wharf," he said. "When it was clear that a few of them would have their sails up all night, I had the first gleam of the possibility of this photograph." Ralston rowed ashore and set up for the shot as darkness fell. "My intoxication over what I beheld was compounded as I realized that the Milky Way was directly over the assembled fleet. Icing on an exquisite cake, if you will," he said. "Wonderful laughter and singing from the boats rang through the anchorage, punctuated by the lilting cries of loons at both ends of the harbor. It was, in all, a scene of surreal beauty. I knew I had found the perfect title when I learned that a shared Chinese and Japanese term for the Milky Way is "river of heaven." 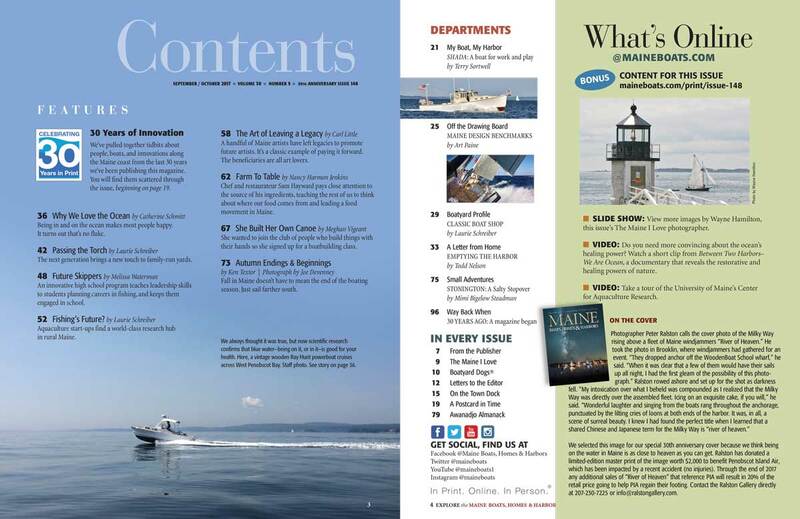 We selected this image for our special 30th anniversary cover because we think being on the water in Maine is as close to heaven as you can get. Ralston has donated a limited-edition master print of the image worth $2,000 to benefit Penobscot Island Air, which has been impacted by a recent accident (no injuries). Through the end of July 2017 any additional sales of "River of Heaven" that reference PIA will result in 20% of the retail price going to help PIA regain their footing. Contact the Ralston Gallery directly at 207-230-7225 or info@ralstongallery.com.